The cruiser was built at Germania Werft in Kiel and commissioned in Tsar's Navy in 1900. She belonged to the Baltic Fleet. During the first Japanese-Russian war she was in 1st squadron during the Japanese encirclement of Port Arthur. The Russian fleet consisting of five battleships, three cruisers including Askold and few torpedo boats under command of admiral Wilheft met the Japanese fleet under command of admiral Togo. Main Japanese forces consisted of four battleships, two new battle cruisers, cruisers and torpedo boats. The Russian fleet was defeated and the commander died. From 18 squadron units only 10 came back to Port Arthur, the other ones escaped. In an engagement with the Japanese cruisers Askold broke free through the enemy encirclement and made it to Shanghai where she was interned. At the outbreak of WW1 Askold was on Pacific. Later she was sent to Mediterranean Sea where she took part in numerous operations including the Dardanelle one. In 1916 she went to Far East. Askold crew didn' t join the October Revolution and i n 1918 Askold took part in some interventions. Later she served in the British Navy as auxiliary unit Glory IV. In 1920 she was disarmed in one of British ports and in 1922 sold for scrapping in Hamburg. The Askold activities on the Mediterranean Sea during WW1 were vividly described by Polish author Bruno Dzimicz (literary pseudonym of Wlodzimierz Steyer, later commander of Polish Navy) in "Lonely Cruiser" / "Samotny krqzownik" (1936). At this time he was officer on a ship. The name Askold comes from prince Rurik's boyars from second half of 9"1 century. Askold and Dir in 862 led the first Kiev Russian troops against Constantinople. In 882 both boyars died after conquering Kiev by Novgorod prince Oleg. The model is presented in the original dazzle painting - since the Russian-Japanese war the unit was painted grey. In 1870 Russia regained the rights to operate on the Black Sea. Projects a strong fleet defending the Russian coasts were started. Unfortunately t conditions of high firepower and thick armour belt together with small draught and good manoeuvrability couldn't be fulfilled by the traditional units. A project of a new type of ship was presented by admiral Andrey Alexandrovich Popov. Popov's new monitor, strongly supported by the tsar, was started on 17th December 1871. The assemblies were built at New Admiralty Shipyard in Petersburg and then transported by ship and tram to the Black Sea. The unit was assembled in Nikolaiev and launched on 21SI May 1873. Novgorod was commissioned in 1874. According to the project the unusual construction of the ship enabled stability and good manoeuvrability thanks to the possibility of turning around, but first tests verified the theory. Seaworthiness was very poor, instead of delicate rolling on the waves there were low frequency vibrations that made sighting impossible and the ship turned round after firing. The speed was far to low and with its turning ability the ship was very difficult to steer. 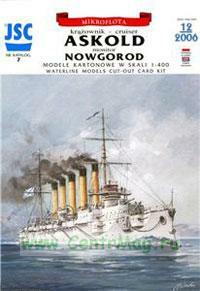 Novgorod was never used in a battle and was decommissioned in 1903.